Metrolinx and the Toronto Parking Authority have partnered up to expand Toronto's Bike Share program. The new partnership will more than double the city's Bike Share network to create a world class bike share system for Torontonians. Through the partnership, Metrolinx will purchase $4.9 million worth of bikes and docking stations that will primarily be installed near transit stations. 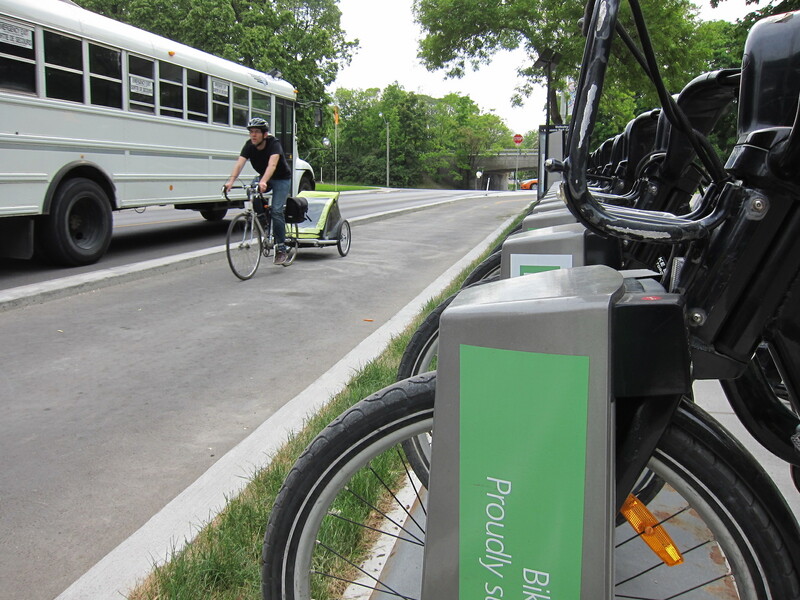 "The majority of the bikes and bike stations will be deployed in Toronto by the end of 2016. The locations have not yet been determined, but will be determined based on a set of criteria designed to maximize usage (i.e. being placed close to transit stations, institutions and dense areas where demand is likely to be strong)," said Media Relations and Issues Specialist, Alex Burke. "The remaining portion of bikes and bike stations will be installed outside of Toronto through a two-year pilot program in a willing GTA host municipality, to be implemented by December 2017. The process and criteria for allocating new bikes and stations will be established by fall 2015. All Metrolinx-owned bikes and stations will be deployed within 3 kilometres of a transit station"
As part of the partnership, the Toronto Parking Authority will source and deploy the bikes and docking stations and will continue to operate Bike Share Toronto as it currently does. Bike Share memberships is an affordable and practical way of getting around the city with yearly memberships priced at $90, and $18 for a monthly membership. Bike Share Toronto currently has more than 4,000 active users. Along with expanding the current network; the new partnership could see the possibility of the news stations fully integrated with GO train and TTC systems. "At this time the new stations will be fully integrated with existing bike share stations but the technology is not in place currently to integrate the payment system with Go and TTC payment systems," said Rita Mezzanotte of Toronto Parking Authority Communications . "However, this is an area that we would like to address as we believe it would provide a valued service to our customers." Metrolinx hasn't explicitly stated how many bikes and/ or stations the $4.9 million will buy but we hope this expansion becomes a reality soon. We are also still hopeful that the 22 stations promised as part of the Pan Am 'legacy' will beome a reality soon too. We will keep you posted on the dandyBLOG to new developments.